How Many Americans Have Never Shot A Gun? LuAnn de Lesseps, Sonja Morgan and Ramona Singer of “The Real Housewives of New York” pose on a shooting range to promote an episode in the reality show’s sixth season. Guns are popular and a lot of people have them. How many people have never shot a gun? In March 1999, 33 percent of respondents said they had never fired a gun (Gallup, 1,021 telephone interviews). I could say that the percentage of Americans who have fired a gun hasn’t changed much. But there just isn’t enough data to make that conclusion. 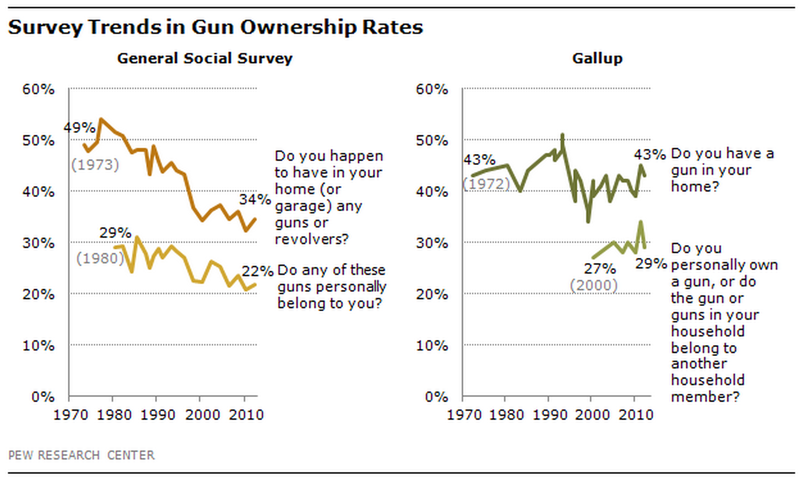 So I’ll look at another indicator of Americans’ direct experiences with guns: ownership trends. Although we have more historic data here, I’m still forced to rely on surveys, since the government doesn’t keep track of who owns a gun. Those surveys don’t all tell the same story. Gallup shows that the percentage of Americans who own a gun has fluctuated but is now the same as it was in the late 1970s. By contrast, the General Social Survey (GSS), which is conducted every two years by the University of Chicago, finds that there’s been a significant decline in the percentage of households that own a gun since the late ‘70s. Based on their polls since 1993, Pew Research Center agrees with the trend in the GSS. But is gun ownership even a good way to understand how many Americans have fired a gun? It’s hard to say, but a 1989 survey did find that 95 percent of 605 people who said they owned a gun also said they had fired it (“while target shooting, while hunting, just for fun, for self-protection, to scare someone, or for any other reason?”). You told me in a follow-up email that you’re in the 69 percent who have fired a gun at some point in their lives — that you did so in your Boy Scout days, but that your wife has never touched one. Which got me wondering if we know anything about which Americans are most likely to have shot a gun. We don’t. But we do know, thanks to a Pew survey from February 2013, that 61 percent of U.S. adults who own a gun are white men. Overall, then, more Americans have fired a gun than haven’t. And that majority probably rises among Americans who are white and male.